This IDE to Compact Flash SSD Adapter Card allows you to convert a single Compact Flash (CF type I/II) Card or MicroDrive into a bootable IDE Solid State Drive, a simple and convenient way to replace a IDE hard disk drive. The adapter card makes it easy to build your own do-it-yourself SSD (requires CF card or Micro Drive), allowing you to take advantage of the benefits that Solid State storage has to offer. With no moving parts, an SSD is the ideal solution in work environments desiring the key properties of SSD's, low power consumption, no noise, shock resistance, fast access time and low operating temperatures providing cooler and quieter storage than a conventional hard disk drive. Plus, Solid State drives are less susceptible to atmospheric hazards (e.g. dust particles, atmospheric changes etc. ), ensuring seamless performance regardless of environmental factors. The adapter is equipped with both a 40 pin (3.5in Desktop HDD) IDE channel or a 44 pin (2.5in Notebook HDD) IDE channel. 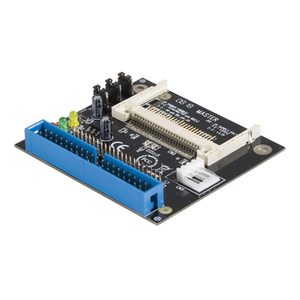 This unique multi interface board allows the adapter to be used in both regular and small form factor case designs, create a perfect solution for embedded systems.